When the cannons speak, the Muses are silent. And the architectural moments are being destructed. The revolts in Libya grew into the military conflict with the involvement of the troops and aviation of NATO. The war threatens the Libyan monuments of architecture, which are listed by the United Nations Educational, Scientific and Cultural Organization (UNESCO) as World Heritage sites. 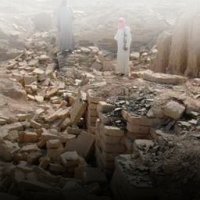 The old town of Ghadames known as 'the pearl of the desert', has already been under shelling of the governmental troops. Now the ruins of Leptis Magna, a prominent city of the Roman Empire, are in danger. NATO has the information that the arsenals of Gaddafi’s troops are located there and plans to bomb them. Recently, UNESCO has appealed to both sides - the governmental troops and the Libyan rebels supported by NATO demanding them to refrain from military attacks to protect the World Heritage sites in Libya. So far the monuments are safe but the threat of their destruction remains, Eleonora Mitrofanova Russia’s representative in the UNESCO says. "The old part of Ghadames with impressive examples of traditional pre-Saharan whitewashed architecture is the World Heritage site. The ruins of Leptis Magna, a prominent city of the Roman Empire, are located 130 kilometers east of Tripoli. It is a unique ensemble which was called the African Rome. Of course, nobody is going to destroy the masterpieces deliberately but during bombardments nobody can guarantee anything." Libya has five World Heritage sites. Besides Ghadames and Leptis Magna they include Cyrene, an ancient town dedicated to Apollo, Sabratha, a Phoenician trading post which served as an outlet for the trade with Central Africa and the rock art sites of Tadrart Acacus in the desert region bordering Algeria. Unfortunately, UNESCO’s appeal to the warring parties is the only thing it can do to protect the sites from destruction. The warring parties should look for peaceful ways to resolve the conflict and we can only urge them to stop military actions, Eleonora Mitrofanova says.